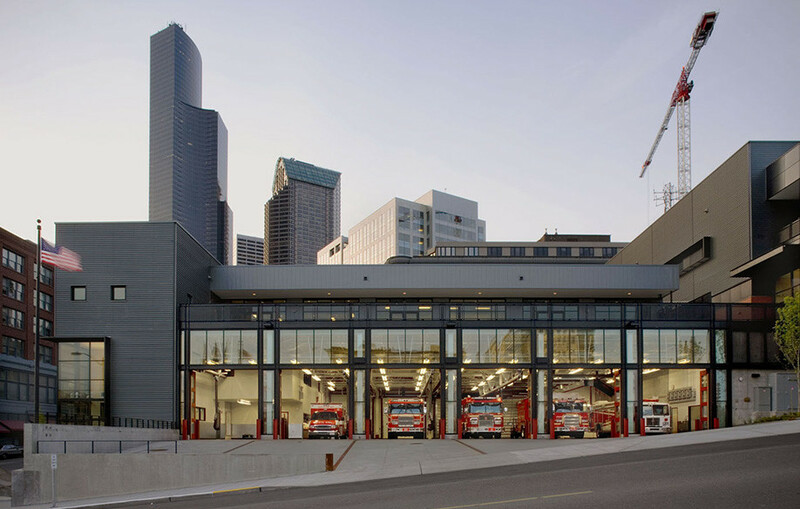 The City of Seattle Fire Station #10 project involved the development of a new 60,000 square foot facility that houses three primary elements: Fire Station operations, a Fire Alarm Dispatch Center, and an Emergency Operations Center (EOC), with 44 on-site parking spaces. The 29,600 SF Fire Station visually anchors the block and includes seven apparatus bays for one engine company, ladder unit, aid unit, hazmat unit, decontamination facilities, bunkroom, kitchen, shower and restroom facilities. The Seattle Police Department Emergency Operations Center includes an operations area and 24-hour duty room, conference and classrooms, interagency coordination room, isolation room, radio communications center, and a media briefing room. During a declared emergency, the EOC serves as the seat of Seattle City government. The emergency response facility also includes many sustainability features and achieved LEED Silver designation.